Vision - "Whole Persons in Whole Communities"
Mission - "Partners in Healing, Health Resources and Professional Education"
**Upcoming event alert: The Association of Spiritual Caregivers presents Reverend Dr. Alex Gee on May 2nd. He will speak on dismantling racism as health, trauma and spiritual caregivers. Full event details available on our blog. 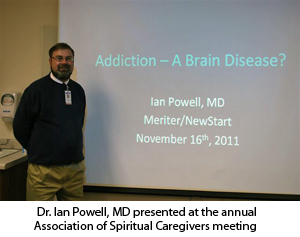 We are pleased you are considering joining the Association of Spiritual Caregivers (ASC). The ASC is a voluntary association of more than 130 area faith community leaders that work with UnityPoint Health - Meriter and our Department of Spiritual Care to promote health and healing in body, mind, and spirit. The Association provides spiritual care within the hospital; learning opportunities for faith community leaders; and assists area faith communities in their efforts to be centers of health and healing. Unlimited visiting privileges with faith community members and others you may be asked to visit. Ready access to information required in caring for the needs of patients. A parking pass to streamline parking privileges when attending ASC events or when calling within UnityPoint Health - Meriter hospital. Access to the our medical library. Access to our employee exercise facility. Employee discounts for services received at UnityPoint Health - Meriter. These ministries all offer an opportunity to serve community members, and grow personally and professionally. If you would like to join the ASC, please fill out the application that's below and send it to Yonason Meadows, yonason.meadows@unitypoint.org and Charles Orme-Rogers, charles.orme-rogers@unitypoint.org. We will review your application and notify you of your acceptance. New members will need to pay annual dues ($35/member) and complete the orientation program. If you have any questions, please call (608) 417-6480.